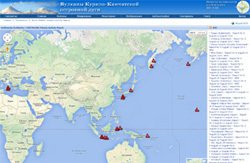 The geoservice shows locations of volcanoes and submarine volcanoes in the Kamchatka-Kurile region, as well as status of active volcanoes etc. The geoservice shows the Holocene volcanic formations, provides information about their genetic type, composition, age etc. The resource shows the locations of lava flows and sampling zones of the 2012-2013 TFE-50, as well as eruption centres within Plosky Tolbachik. Карта получена методом Nightfire по мультиспектральным изображениям со спутника Suomi NPP. 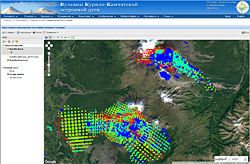 The geoservice provides a plan of glaciers and possible lahar flows directions within the Kamchatka Northern group of volcanoes. 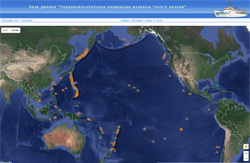 The geoservice shows locations of Pacific submarine volcanoes. The resource shows the locations of all volcanoes in the world based on the Volcanoes of the World database including descriptions and brief information about each volcano. 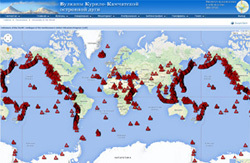 The service provides information on all world active or unrest volcanoes based on weekly activity reports from various volcanological observatories all over the world.